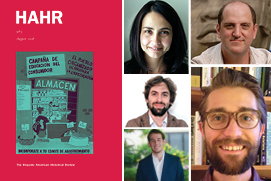 The upcoming August and September journal issues of Hispanic American Historical Review (HAHR) will highlight the work of several UT History Latin Americanist Scholars, including Assistant Professors Lina Del Castillo and Joshua Frens-String, Associate Professor Matthew Butler, Ph.D. Alumnus (and future Postdoctoral Fellow) Adrian Masters, and History Honors Alum Kevin Powell. Dr. Del Castillo is assistant professor of history and Latin American studies at the University of Texas at Austin. She is author of Crafting a Republic for the World: Scientific, Geographic, and Historiographic Inventions of Colombia (University of Nebraska Press, 2018). Her essay “Colombian Cartography in the Production (and Silencing) of Independence History” appeared in Decolonizing the Map: Cartography from Colony to Nation (University of Chicago Press, 2017). She has won grants and fellowships from several bodies, including the Institute of Latin American Studies at the University of London's School of Advanced Study, the Kellogg Institute for International Studies at the University of Notre Dame, the Fulbright-Hays Program, and the John Carter Brown Library. Del Castillo's work examines how an array of scientific practices that emerged in the early 19th century intersected with processes of nation-state formation, republicanism, and contested claims to land and resources. Her current research focuses on the centrality of an early 19th century “Colombian/Columbian/Colombie” polity in the emergence of global republicanism, print culture, and global modern science. She will present a book talk at the Institute for Historical Studies, co-sponsored by LLILAS Benson Latin American Studies and Collections, on October 9, 2018. Details at: https://liberalarts.utexas.edu/historicalstudies/events/47445. Joshua Frens-String’s article, “Communists, Commissars, and Consumers: The Politics of Food on the Chilean Road to Socialism,” examines the politics of food during Chile's Popular Unity (UP) revolution (1970–73). Organized around the rise and fall of the Juntas de Abastecimiento y Precios (Price and Supply Committees, JAPs), a state-backed network of collectively managed stores and ad hoc food distribution sites, the article explores how the UP revolution expanded long-standing practices of community-led price monitoring and food distribution to make the promise of economic democracy more concrete for urban, working-class consumers. As the JAPs' power grew, however, such efforts became a political lightning rod, unifying Chile's domestic opposition around the claim that the state's presence in the food economy—rather than its absence—created scarcity and needlessly politicized domestic life. Ultimately, the article contends that the consumer marketplace was a key arena for competing conceptualizations of democracy and the state in early 1970s Chile, anticipating the centrality of consumption to the neoliberal counterrevolution that the country experienced in the post-UP era. Dr. Frens-String is an assistant professor in the Department of History at the University of Texas at Austin. He is currently writing a history of food, consumption, and revolution in twentieth-century Chile. He will deliver a workshop at the Institute for Historical Studies on October 1, 2018, titled “Red Consumers: Food and Mass Politics in Mid-Century Chile, 1918-1948,” which you may read more about at https://liberalarts.utexas.edu/historicalstudies/events/47584. Last but not least, Adrian Masters’ “A Thousand Invisible Architects: Vassals, the Petition and Response System, and the Creation of Spanish Imperial Caste Legislation” explains two unique aspects of the New World Spanish empire: its production of hundreds of thousands of royal decrees, and the unique categories that these edicts contained, such as mestizo and mulato. Masters outlines the petition and response system, through which vassals of all social backgrounds constantly suggested new laws to the ruling Council of the Indies. Pressed for time, the council's overwhelmed ministers often transplanted petitions' vocabulary verbatim into decrees. This meant that subjects often phrased imperial laws minor and major, regional and Indies-wide. Using a four-step archival methodology, this article demonstrates how scholars can match vassals' petitions to decrees. This essay then shows how legal categories such as mestizo and mulato came about through the petitions of not only Spaniards but also Indians, mestizos, and mulatos themselves. Subjects of any social background could therefore introduce and shape Indies legal constructs, and the empire's agenda, from the ground up. Adrian Masters is a writing fellow and graduate student in the Department of History at the University of Texas at Austin. His research interests include subjects' engagement with the Spanish empire's justice system, the rise of racial or caste classifications in the sixteenth-century Indies, and how vassals invoked the past in everyday life as a social resource during this period. More generally he is interested in Middle Eastern, European, Atlantic, African, and indigenous history. He is finishing his dissertation and coauthoring a monograph with Jorge Cañizares-Esguerra, tentatively entitled The Radical Spanish Empire (Harvard University Press, forthcoming), which explores how and why Spanish imperial paperwork contained many intellectual and social breakthroughs that scholars have generally associated with the print culture of the northern European Enlightenment. He will be a Postdoctoral Research Fellow at the Institute for Historical Studies in 2018-19, where he will present a workshop entitled “Building an Empire of Knowledge: The Sixteenth Century Spanish Imperial Council of the Indies’ Legislative Hermeneutics from Theology to Archive,” on September 24. Details at: https://liberalarts.utexas.edu/historicalstudies/events/47481. His publication work was recently featured in an interview on the History Department's web site. Read their articles in the August issue of HAHR, at: https://read.dukeupress.edu/hahr/issue/98/3. This fall, HAHR will feature contributions by Prof. Matthew Butler and History Honors alum Kevin Powell. HAHR, published in cooperation with the Conference on Latin American History of the American Historical Association pioneered the study of Latin American history and culture in the United States and remains the most widely respected journal in the field. HAHR's comprehensive book review section provides commentary, ranging from brief notices to review essays, on every facet of scholarship on Latin American history and culture. Read more about HAHR inan interview with George Reid Andrews, former senior editor, marking the 100th anniversary of the journal. Photos from top left, counter clockwise: Lina Del Castillo, Matthew Butler, Joshua Frens-String, Kevin Powell, and Adrian Masters.